My Name is Joyce Cook, I currently have three Border Collies, Tom 11, Fred 8 and Phoebe 3. 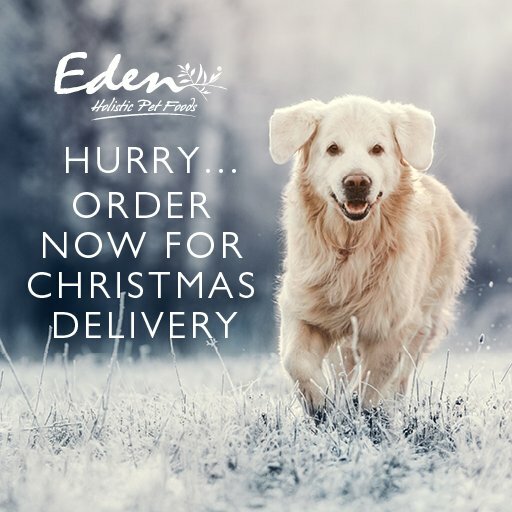 They are all fed on Eden Holistic Working Dog Multi-Meat Formula. I was initially dubious about how the high protein would affect them, as people tell you high protein causes dogs to be ‘hyper’. However, I now know that ‘quality protein’ doesn't make them hyper at all. Quite the opposite in fact! At home my dogs are calm and settled, but when they are training or competing at Agility they are very enthusiastic and all three are very highly driven. I have competed in agility for many years with my previous dogs Jess and Max, as well as Tom and Fred when they were younger, but then had a few years away from it. Since our return to training and competing during 2014 (and having been fed on Eden since the middle of 2013) we have had a very successful year. Agility classes are won with just hundredths of a second between the placed dogs, so any rosettes won are an achievement. Tom competing in Veterans has won 3 classes as well as several other places and has had some amazingly fast times – far faster than you would expect from a Veteran dog! Fred has competed in “any size” classes over lower jumps whilst recovering from surgery and also at full height in grade 4 has had 2 wins, some 2nd places and lots of other placed clear rounds. Phoebe made her agility debut competing in Grade 3 has been amazing and I receive compliments from strangers on how well she works. She has had 2 Jumping wins at grade 3 as well as several second places and 4 second places in grade 3 Agility classes. This means she only needs one win to move up to grade 4 and I’m confident this will happen early into the start of the season – whether I’m ready for it or not! Last season my dogs managed 83 rosettes between them as well as quite a few trophies which is an amazing result. We do agility because we love it, but to see them being successful doing something they love doing is the icing on the cake. All of my dogs are in great physical condition and are a healthy weight with good muscle tone. They love their food, and eat enthusiastically, never needing to have anything added to encourage them to eat it! We are very much looking forward to the start of the show season and thank Carol and Paul for their continued support as I am sure that being fed a very high quality food has played a part in their general health, fitness and their success.